Wonder Weapon is sort of a hybrid. It starts out reading like a modern politico-military thriller before revealing itself to be classic scifi. But even with that, it defies typical classification. Regardless, it is a fun read. The book revolves around a mysterious box sent to an equally mysterious office run by an Air Force colonel outside of Washington, DC. The box contains documents going back almost 900 years which seem to indicate that something strange has been going on in Europe, possibly associated with a meteorite and the Roman Catholic church. There are indications that the Nazis had taken a strong interest in the subject, possibly to be able to construct a powerful weapon. A young historian is called in to decipher some of the documents, and she uncovers a puzzling trail of people who seemingly are searching for whatever secret exists, but who are stopped in their efforts, quite often with their violent deaths. Meanwhile, former East German Stasi agents are also on the trail of the secret. The Air Force colonel contacts his pet agent in Berlin, someone with his own secrets, and sets him to uncover just what is the secret and why is it important. There are warnings, though, that whatever it is, it is pretty dangerous and might be best left alone. The author is an Air Force veteran, so his militarese reads true. I am not sure I buy the primacy of an Air Force colonel as the center of so much clandestine authority, but accepting that, the language, the various military aircraft, the facilities in Berlin, and the little civilian touches of Berlin are convincing. In order to set the stage for various events surrounding the secret, the author goes into some historical background of various times and events. This flows fairly well without breaking the flow of the base narrative. There were a few historical inaccuracies, but generally speaking, the mini-lessons were interesting and added to the book. When the narrative jumps back from the present to the historical past, the author stars with an epistolary narrative voice, using journal entries found in the mysterious box, then shifts quickly to a third person omniscient narrative mode. The first time he did this, I was a little confused, but then I saw the benefits to it and rather liked this jumping back and forth throughout the book. The journal entries bring a sense of realism and put the reader in the historians place, but then the shifting to the third person mode allows more information to be conveyed, to include the death of some of the subject characters. The book is fairly well edited, and there were only a few inconsistencies. That led to an easy read. The reader could let the storyline flow, absorbing the authors intent. I finished the novel in two evenings. The author has some skill with the written word. 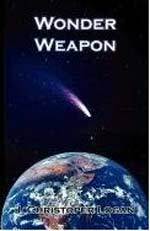 Wonder Weapon was enjoyable, and I do recommend this book to readers interested in history, modern politico-military tales, scifi, and to fiction in general.